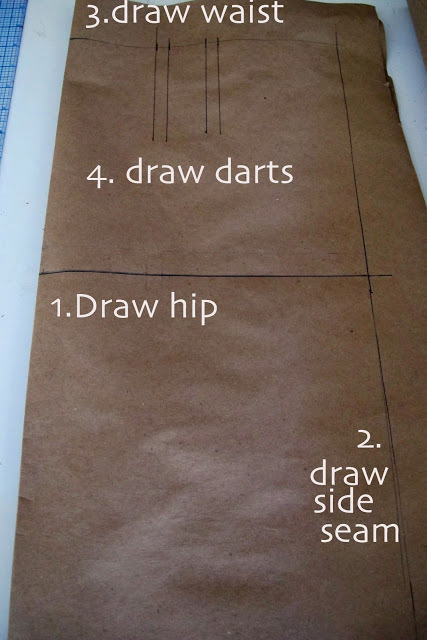 Design It Yourself Clothes Draft Along. 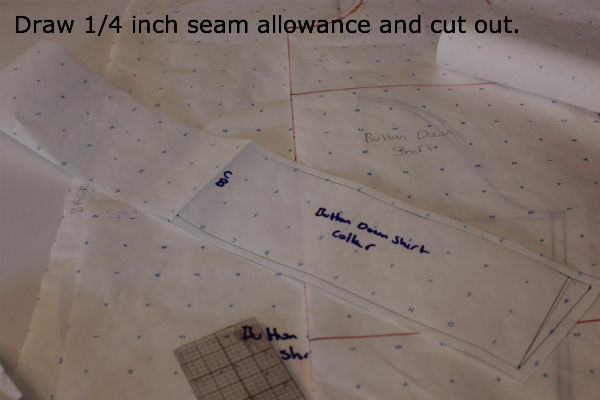 Today I’m drafting the sleeve, collar, and cuff for the button down shirt project found in Design It Yourself Clothes. These instructions can be found on pages 80- 82. But first I got a new blog design! 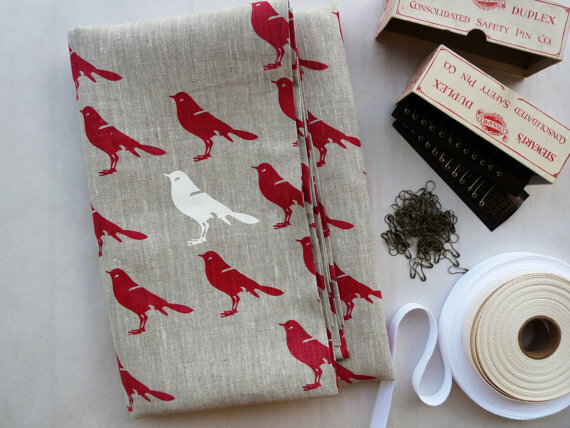 Yes, I get bored of things on the blog and like to change them every one in awhile when my tastes change……. I’m feeling a little more modern these days. I won’t be going into minute detail about the drafting process since you are supposed to be following along in the book with me and well, that would be plagiarism, right!? But I will go over the basic steps here. Hopefully my photos will help you through the steps since there aren’t any photos of the drafting in the book. I was pretty confused at a couple of points and photographing and going over this also helps me to regrasp these concepts. Although I studied this in school I don’t even remember drafting a button down shirt! Plus, it was a long time ago, trust me. Also, don’t forget to add the ease into your measurements or else your shirt will be skin tight. 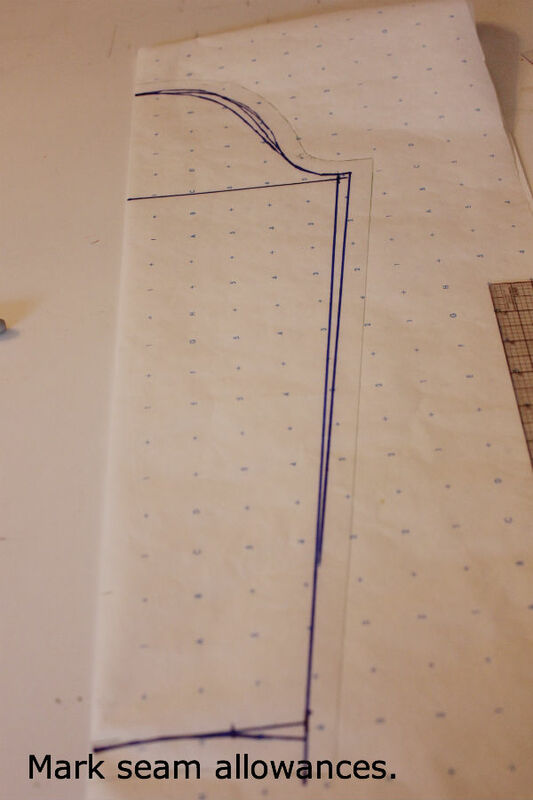 Drafting the A line skirt. Fitting the A line skirt. My completed A line skirt and T shirt and tips from Cal Patch about drafting with knits. 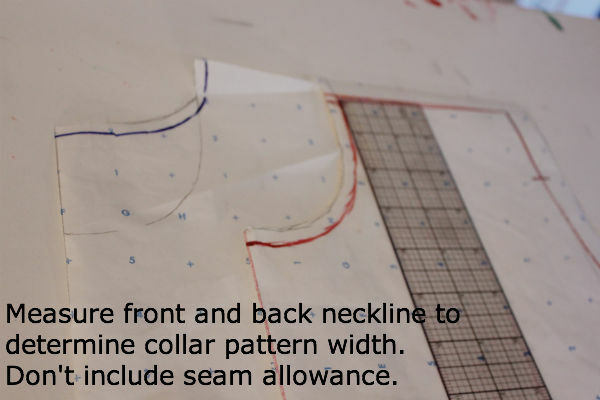 Drafting the button down shirt front and back. First off that should read wrist not waist up on the picture. Sorry. 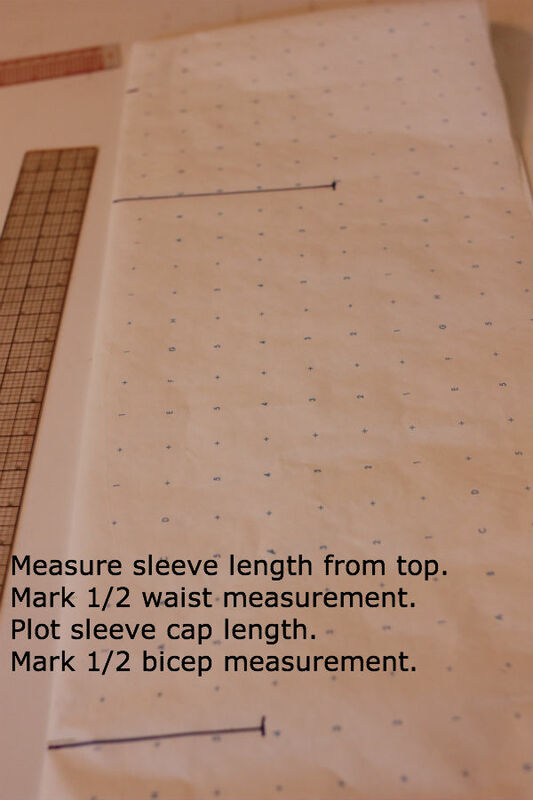 To figure out where to draw the beginning of your sleeve cap which will also be the bicep line you are supposed to use a formula of 2/3 the armhole height you drew on your shirt front and back pieces. Since my armhole height was 8 inches I drew my bicep line 5 3/8 inches down from the top. 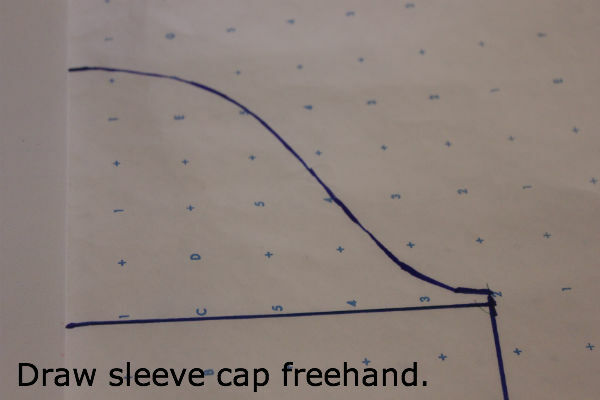 The book tells us to draw the armhole cap freehand. My other books have a more complicated method of measuring this but this way is much simpler, although perhaps not as accurate as we will see. 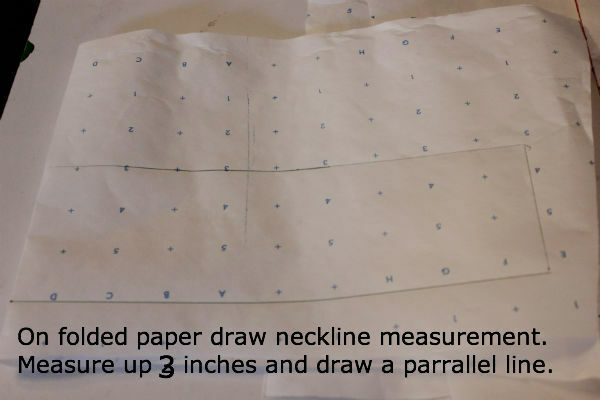 You need to draw two straight 1/2 inch lines from the top fold and side seam first. That way your seams will be square. 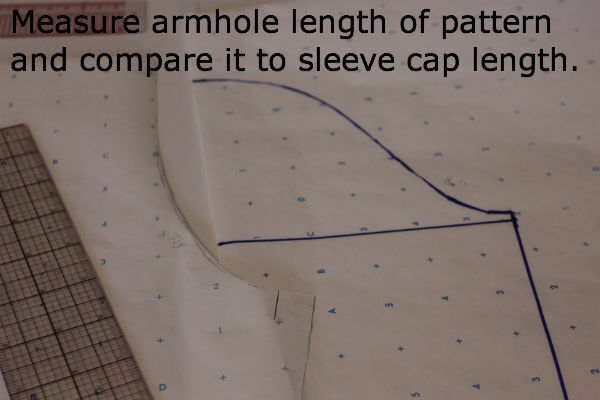 Now measure your sleeve cap length and measure the armhole of the shirt. 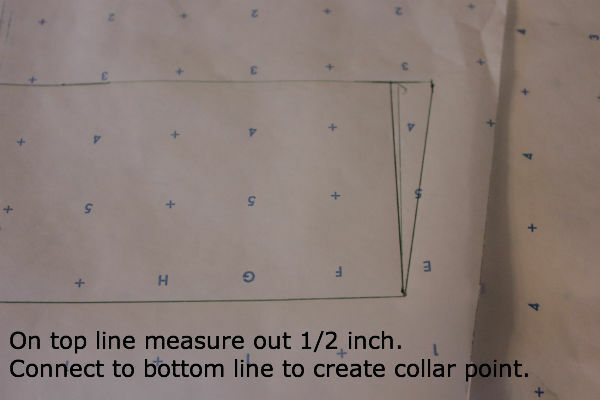 Make sure not to measure the seam allowances on the shirt front. I had to add a little length to my side seam and made the cap a little wider as you can see. 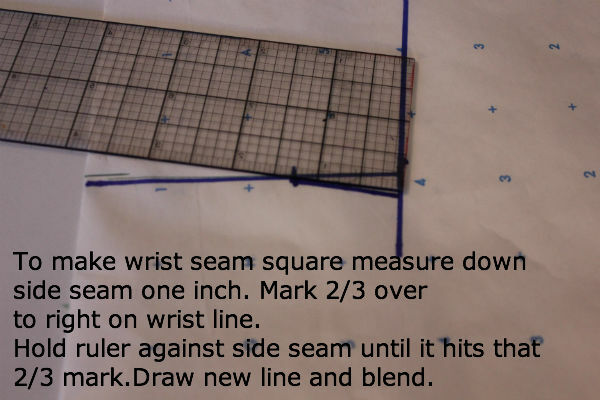 Connect the wrist mark to the bicep mark with your ruler. You will need to square your wrist side seam edge. You edges should always be squared. I like this method shown above. 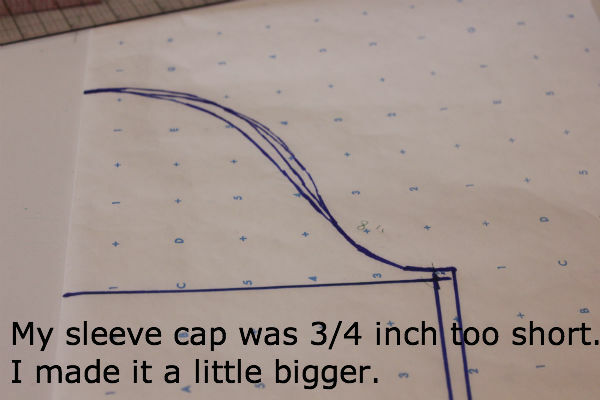 On to the cuff piece which is super simple…..
Just a note if you have been following. I’m going a little slower than I wanted to so I apologize. Hopefully I will show my muslin on Tuesday and show my final version on Friday. The week after that, I will be drafting the pants pattern and dress and that will be it for the series. 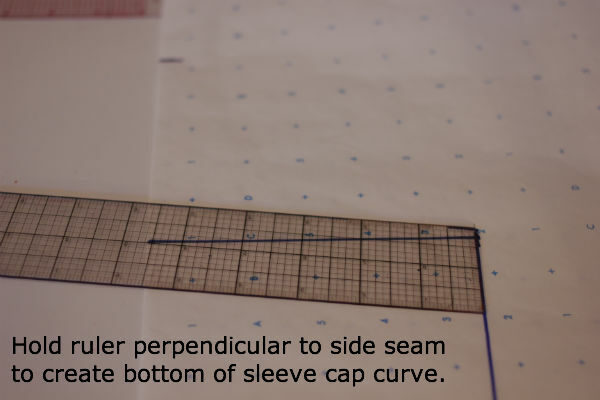 You know, I came across a really cool tip that I use with all sleeve cap drafting now – use leaded upholstery cording. I mark the length of the armscye on the cording with pins, then shape it into what an arm cap should look like on my sleeve top – helps me a lot since I’m not great at freehanding. Since it’s leaded it sits on the paper easily while you trace your shape. 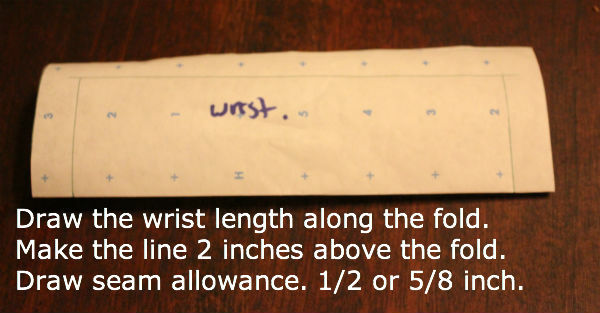 And it’s easier to freeform than those bendy rulers (I have one of those too, but don’t use it for sleeves). I’ve been on the fence about this one. I have such back luck with button down shirts- I may just sit this round out until I’m feeling braver (ie have more after the holiday time) I’m interested to see how everyone’s turns out. Justine, I know you apologized for going slower than you had originally planned, but I’m so thankful you aren’t. I’m trying hard to keep up with limited time, and the slight slow-down has really helped. So, keep up the good (slightly slower) work! If I had gotten too far behind, I’m sure I would have given up. This is just right. I just started following your blog. Can you give me a link to the book you are referring to? I like your new blog layout… clean and simple. Thanks! I’m actually relieved you are going at a slower pace… it’s giving me a chance to keep up! Just finished up my muslin of the basic tee… now cutting the real thing. Thank you Justine, for, essentially, the clearest tutorials. Both the diagrams and simplified steps help me sort it out. I’ve made three of the A-LIne skirts so far, and a half-circle skirt from another drafting designer which is waiting to be donned. I really wish I had constructed my own drafts for clothing when I learned to sew in my 20’s. I might have saved a fortune. I’m on board now, and with amazing tutors like yourself, there’s still time to enjoy wearing clothing I make yourself.